Early in 1996 we dropped out of the corporate and high tech worlds to pursue our new found love affair with each other and the tango. Looking into the future we reckoned that we had at least twenty years of strong legs on which to dance our way around the world. Unknowingly we become the first full time couple teaching across the USA for a span of ten years on a continuous basis. With still a few years left on that twenty year investment of good legs, we still dance and teach, but have become more grounded in our adopted city in the South, New Orleans. Unexpected events of life have made us stop, and look back, realizing that we had never set aside the time to rekindle the memories embedded in dozens of photo albums, VHS tapes, Digital 8 and Mini DV cassettes. One photo in particular brought back memories of an aspect of our lives that we seldom talk about, or arguably brag about. The photo was of a sign that hung on the front gate of our Silicon Valley home. It was the first sign that welcomed those who entered our Planet Tango. 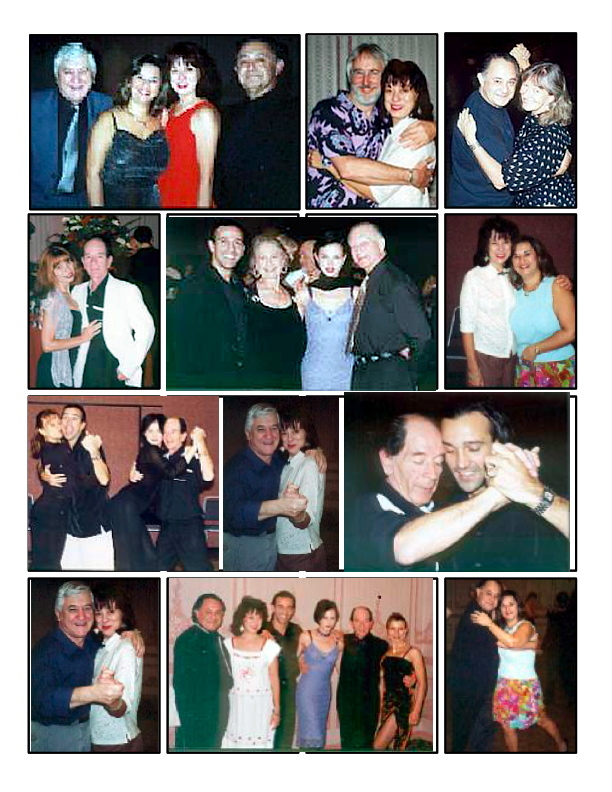 From 1996 to 2000, we served as the gateway into the Bay Area tango community for many well known and a few unknown artists… We promoted, translated for, and provided work opportunities to the initial wave of visiting dancers from Argentina. We were also innkeepers and house hosts to many of them. Those were wonderful years of non-stop tango life, a period in time when we didn’t realize how important it was to help so many artists to break into the new world that the USA was to become for tango… With a few exceptions, we have never heard from most of them again. So we don’t know if they ever felt the love, dedication and generosity that was gifted to them. authentic Sexteto Tipico orchestra, and the kindest and most gracious dancers around. They were in for a major treat, and somehow they became part of the spontaneous outburst of an unusual phenomenon known as vuja de, the distinct feeling that something that just happened, had never happened before. As Tango weeks and weekends go, the practice of gathering once a year to meet professional dancers and other dancers from around the country, started in 1991 when the Dance Department of Stanford University organized the first Tango Week at its campus in Palo Alto, California. Within five years, there was enough of a confusion about what constituted authentic Tango dancing, and who were or were not qualified to teach it, that “me too” Tango week organizers began to sprout up around the country. dancers affected by the precarious state of the Argentine economy, provided a large pool for organizers to choose from. It behooves that a society, that is built on the principles of free markets and open competition, would provide so many opportunities for tango teachers and dancers to practice the trade. It is also true that in the impatient pursuit of a Happy Meal, people can become jaded at the prospect of a five-star sit down dinner at a friend’s home. When the time came to begin planning the fifth edition of our Labor Day Weekend Tango Getaway, we knew we wanted the equivalent of a four-course dinner, at a five-star location featuring the top chefs around. It was partly selfishness. We had enjoyed the previous four years, as the project, that started as a glorified workshop for some friends in need, turned into a very special annual event from its very inception on Labor Day Weekend 1997. Along the way, non-flattering imitations have failed to pass beyond copycat status much in the same way as something that comes out of a copier can’t match the original look and feel that comes out of a laser printer. We have never forgotten learning to have fun with Gloria and Eduardo in 1995, and having Pablo and Beatriz at our former home in California one year later. So we went to work to bring them back to the USA, and invited all our friends to share the feast. For those who came, it was vuja de like it never happened before. Just before the show, second line music filled the ballroom. Donning beads around their necks, dressed in festive colorful attire, the entire ballroom became an impromptu second line parade around the tables and the dance floor. of the classes, dinners and milongas. We have learned through many years of experience, that respect in this business is earned one dancer at a time, and we look forward every year for the renewed encounter with those who return time after time, and for that first impression for those who venture out to Reno for the first time. Out of respect for the individuality of each participant, we have kept an original and very simple format aimed to facilitate the easiness of attitude adjustment, as weary tangueros from all over the country make their way into the Crystal Ballroom on Friday night. 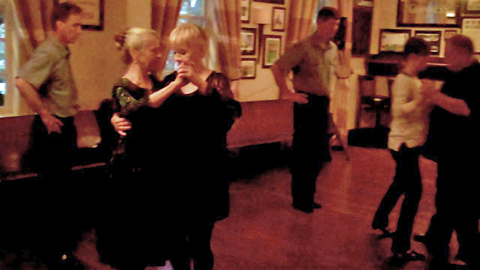 After an informal social milonga Friday evening, the scheduled program of classes get underway Saturday morning, and it repeats Sunday and Monday mornings. Three spacious and comfortable rooms each housed a group of approximately thirty dancers, and the schedule called for all three teaching couples to visit each room three times during the entire weekend. This original arrangement has been a trademark of the Labor Day Tango Getaway since its inception, and it has received rave reviews from almost everyone attending, the principle being one of respect for all teachers and the other participants. The balanced quality of instruction offered at the Labor Day Tango Getaway takes precedence over any teacher’s ego (some measure their success by the number of people who follow them around), and the occasional star struck cholulo who insists on following a particular teacher around. The foremost objective is to allow everyone to have the same amount of instruction and exposure to every teacher. An overwhelming majority of returning participants attest to the success of the method employed to expose everyone to the very best balanced and comprehensive learning experience. By the time the first dressed-to-kill couples begin to make their way into the Carson Ballroom, many months of planning have been logged by Valorie Hart in preparation for this special evening. Shortly after the first day’s classes end, Valorie swiftly moved into her role as a gifted event planner and supervised the transformation of the Carson Ballroom into a chic 1940’s cabaret. Table centerpieces featured miniature replicas of the street lampposts so characteristic of the early Spanish influence in Buenos Aires, and coincidentally New Orleans. Each table got the personal touch of a photo of a poet or musician of the Golden Years. Later Eduardo would complain that dancers never get the same kind of recognition. Valorie, ignoring the rudeness of the outburst, quickly retorted, OK, che, dame tu picture. A succulent buffet, the music of D’Arienzo, Tanturi, Calo, Pugliese, Troilo and Di Sarli and the original setting of the dance floor, had already conspired to create an atmosphere of intense dancing and joyful camaraderie. How else, if not through tango, strangers from extreme points across the country, can extend their arms around each other in sheer jubilation, and give themselves up sensually to the alluring music from another era, which by the magic of their dance, has come alive and everlasting. When Miguel Arrabal and the members of the Sexteto Tipico Arrabal opened the first of many sets to come, with the theme of the evening, Milongueando en el cuarenta, the whole audience’s mood was kicked up several notches. A pregnant silence followed the ending of the song until one by one, the majority of loving tango dancers, realized that they had just danced for the very first time to the authentic sound of the orchestras that played for other loving tango dancers of the Golden Years. A thunderous ovation rewarded with genuine appreciation the live classical rendition they had just danced to. The highlight of the evening was the much waited Exhibition by the Masters. The show had variety, punch, personality, and a grand finale that brought the house down with cheers of approval. The evening grew late and the dancing continued into the enchanted night. Tomorrow would be another day. Sunday evening is one of the most anticipated experiences particularly for the majority of returning participants. For the newcomers is a unique and memorable Tango Fest highlighted by the active participation of the dancers attending the Labor Day Weekend Tango Getaway. The second day of classes had ended and once again Valorie morphed into a busy butterfly assisted by Billie, Carlota, Joe, Alberto Gonzalez, Enriqueta and the competent staff of the Reno Hilton catering department. Their mission this time was to prepare for this special evening, without any doubt, Valorie‘s favorite. The table centerpieces were now showered with beads flown especially from the home of the Mardi Gras. The replicas of the street lamppost had been personalized with miniature French Quarter style street signs bearing the Planet Tango legend on them. This year’s Sunday’s theme menu was Mardi Gras, and the lavish buffet table featured, not coincidentally, New Orleans cuisine: red beans and rice, jambalaya, blackened red fish and pecan stuffing. The night’s main attraction, besides dancing to a live typical sextet orchestra for the second night in a row, was the Student showcase, an exclusive act that brought all participants to center stage. Since Friday, Valorie had been asking anybody who wanted to participate to let her know. By show time, eight couples had volunteered, and the anticipation grew as the moment approached. 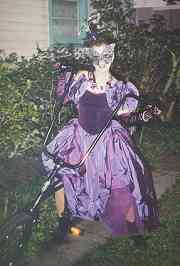 There was a surprise though, and just before the show, Mardi Gras music filled the ballroom. Donning beads around their necks, dressed in festive colorful attire, the entire ballroom became an impromptu second line parade around the tables and the dance floor. Finally, the moment arrived. One by one, the eight couples who had chosen to participate put on a memorable show, while the audience of their peers and teachers cheered and celebrated every move, every display of creativity on the dance floor. The year was 1718, the occasion a one way cruise; the skipper was Pierre Le Moyne, Sieur de Iberville, his mate, brother Jean-Baptiste, Sieur of Bienville. The passengers included French and Canadian immigrants; whores, beggars, Indian slaves, thieves and cutthroats on leave from Parisian jails. The destination, a below sea level collection of swamps in a miserable steamy, sticky and suffocating heated bend of the Mississippi river. Starvation and deadly disease were a threat. Bienville pulled into the quay on May 7, unloaded the passengers, threw their belongings overboard and proclaimed: Welcome to the Crescent City, enjoy the Mardi Gras! Mr. Nick of the Bywater Tango club recruiting on Royal St.
A couple of hundred years later, after being ruled by the French, the Spaniards, and finally purchased by the United States, the state of Louisiana has earned a reputation that some call European and others Third World. 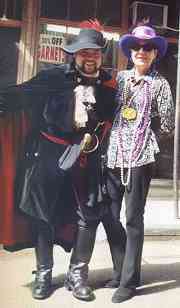 In particular, the city of New Orleans is recognized as the birthplace of jazz, its culinary variety and Mardi Gras. 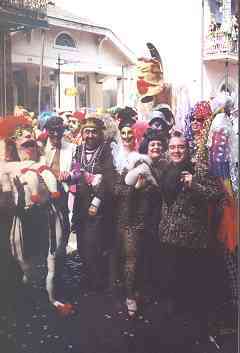 It is said that the celebration of carnaval was imported from France as a ritual that begins on the twelfth day after Christmas and ends at midnight the day before Ash Wednesday. 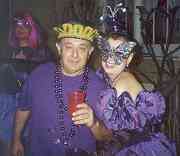 These dates are very familiar to Catholics although there is very little religious about Mardi Gras. Some say that the Church gave up trying to fight the decadent pagan tonesof the celebrations by its faithful, and looked the other way while people went out indulging in food, drinks and other carnal excesses, so their bodies would be strong enough to endure the Lenten period of fasting and abstinence. This is a city where the smell of crawfish boil turns more people on than Chanel #5, and where waitresses at the local sandwich shop tell customers that a “dressed” fried oyster po-boy is healthier than a Caesar salad. The major topics of conversation when you go out to eat are: restaurant meals you have had in the past, and restaurant meals you plan to have in the future. People don’t learn until high school that Mardi Gras is not a national holiday. For visitors, New Orleans is Bourbon Street, and Mardi Gras a time for housewives and coeds to expose their breasts in exchange for plastic beads. It is actually the outsiders, who for fourteen days, fill the city coffers with a cool billion dollars, litter the streets with a tonnage of garbage and convert Bourbon Street into the greatest loitering place in America. Major Mardi Gras parades have long abandoned the French Quarter because the growing size of the floats and crowds began to pose a major fire hazard. However three walking parades “roll” through the streets of the Vieux Carre, and neighboring Fauburg Marigny and the Bywater. 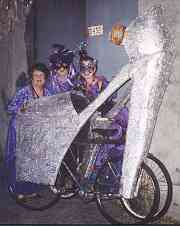 The Krewe de Vieux and the Krewe of St. Ann are for humans. The Krewe of Barkus is for all the dogs of the city (the four legged variety) and parades exclusively in the French Quarter. The super krewes and the big parades now roll through the streets of surrounding neighborhoods, continuing a tradition that began just before the Civil War, when a secret aristocratic society of well bred white supremacist founded the Mistick Krewe of Comus for the purpose of saving the spirit of Mardi Gras, which they felt had been condemned to extinction by the idle and feckless Creole of colonial and Catholic heritage. The old line formula has not changed a lot: a host of black men lead the parade with propane gas tanks on their backs waving flambeaux; high school marching bands; masked horseback riders and police squad cars march in between tractor pulled floats overflowing with lights. They sport giant theme figures, from mythology to Star Trek, to political satire. They are manned by masked riders wearing elaborate customs and donning titles such as kings, queens, captains, pages, marshals and throwers. For a first time participant, as a parade slowly rolls through streets lined with enraptured spectators, who seem capable of pushing little old ladies out of the way to catch Mardi Gras throws, one wonders if some will leave the parade with footprints on their hands. In reality, one quickly learns how to avoid catching beads with the nose, how to befriend fellow catchers, and how to go home with the booty of trinkets caught from the floats hanging around the neck. Although the plastic beads from Taiwan, which have long replaced the original glass beads from Czechoslovakia, have no other value than that charged at the French Market or other stores along Royal and Bourbon Streets, the whole unjustifiable idea is to run beside the floats, waving hands, jumping up and down, yelling throw me something, mistah, and catching the colored beads before they hit the ground. On Bourbon Street, after midnight and a couple of cocktails with names like hand grenades, hurricanes and goodies, young All American coeds bare their breasts in exchange for fake jewelry to the chants of go, go, go descending from the festooned balconies of the Vieux Carre. The lenses of video cameras propped high above heads and shoulders catch a glimpse of flesh. During the ensuing months, late after midnight in the heartland of America, infomercials will peddle Mardi Gras’ Housewives and Coeds Gone Wild videos on TV with an assortment of revelers exposing their breasts. They will most certainly be followed by lunatic preachers who will inspire other freaks to come on down to New Orleans and second line their way into the parades waving flags with slogans that read Satan Rules and Jesus Judges. WHEREAS, Mardi Gras has cast its fun over our passionate tango nights and care usurped the place where a milonga is wont to hold its way. Now, therefore, do I deeply sympathizing with the general anxiety, deem it proper to join the Annual Festival in this goodly Crescent City and by this proclamation do command assemblage of the Krewe of the Mistickal Nights of the Tango. Given under my hand this, the 1st day of February, A.D. 2001. TANGUS. Further, breaking all old line rules, the Krewe would not require a membership fee, would welcome people regardless of dancing style, gender, race or sexual preference, adopting the motto: Pro bono tango, be nice or leave. 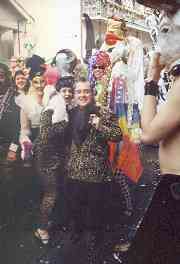 And so it happened that the Krewe of the Mistickal Nights of the Tango was seen second lining at the Krewe de Vieux parade through the French Quarter on their way to the Planet Tango’s Mardi Gras Milonga at Pierre Maspero’s Restaurant. Further, masked and unmasked members of the Krewe continued their carnival celebration through the streets of New Orleans, some having been spotted at the Krewe of Barkus parade holding the leash of at least two of the eighteen hundred canines that joined that parade. 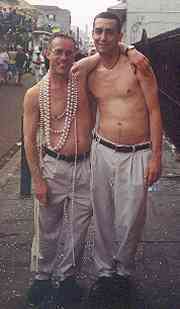 we need more beads! Soon they became unrecognizable under the weight of the tonnage of worthless and hard won baubles. Six weeks of king cakes, Purple, Bunch and countless other balls, lots of street dancing, masking and bead collecting, finally came to an end at midnight on Fat Tuesday, as State trooper cruisers begun to clear Bourbon Street followed by the Krewe of the Sanitation Department. 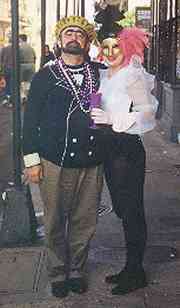 Everybody has gone into fasting and abstinence to shed the extra pounds of king cake from their waistlines. 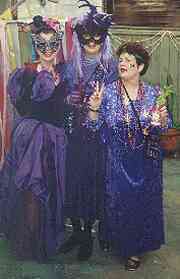 There are only 50 weeks until Mardi Gras 2002 and the next meeting of the Krewe of the Mistickal Nights of the Tango. 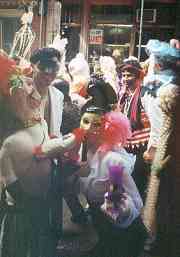 Second line: An informal parade performing impromptu dances that follows the brass bands and floats. Crawfish: One of the year’s four seasons. The rest are, Shrimp, Crab and King Cake. Tchopitulas: A word New Orleanians can pronounce, but can’t spell. Po-boy: A sandwich judged by the number of napkins used. Planet Tango is happy to report the success of its Fourth Annual Labor Day Weekend Tango Getaway held September 1 -4. at the wonderful Reno Hilton in Reno, Nevada. As many of you already know, this is a great Argentine Tango weekend combining classes and socializing at its best. Guillermo Merlo, Fernanda Ghi, Nestor Ray, Patricia Garcia joined hosts and Master teachers Alberto Paz and Valorie Hart for an enjoyable learning experience. Nestor Ray and Patricia Garcia have been dancing together for more than ten years. 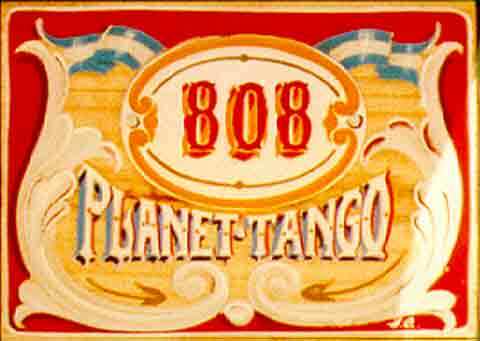 In Buenos Aires they perform regularly in restaurants, cafe concerts, and many traditional clubs and confiterias. They were nominated Best Club Style dancers at the prestigious Hugo del Carril Tournament organized by the municipality of the city of Buenos Aires. They have taught at La Taberna de Ricardo, Social Rivadavia, and Confiteria Mariano Acosta in Buenos Aires, and in Winchester, Stanford, Virginia Beach, Washington D.C., San Francisco, Seattle, Portland, and Ithaca in the US. They have toured Europe teaching and performing with great success in Rome, Geneva, Bristol, London, Paris, Marseilles, and Naples. Guillermo Merlo was in the cast of the San Francisco based company of Forever Tango, and toured with the hit show through England and Italy where he was honored at the Spoleto Festival. Fernanda Ghi danced professionally in Buenos Aires and in Japan before joining Guillermo in Miami a few years ago. Together they danced on Rafael Nicolau’s Tango, Tango Vivo and Tangoing. 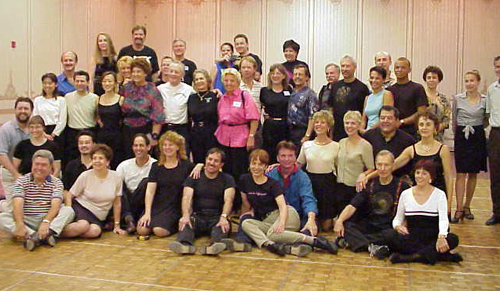 Their own production Tango Dreams has played in several US cities. Their original choreography is mesmerizing and breathtaking incorporating modern concepts to the traditional aspects of stage dancing. 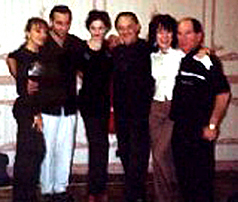 They have taught at various Tango weeks in London, Buenos Aires and Miami, and this was their second appearance at the Tango Getaway. Friday, people began checking in stopping by to pick-up your name tags and schedule of activities and meeting other tango friends on a dance floor ready with good music work out any cramped muscles caused by the journey to Reno. Saturday morning and afternoon was dedicated to classes suitable for any and all levels of dancers. On Saturday night, participants and visitors were treated to the Reno Tango Ball with dinner and a show produced by the teachers. Sunday had the same schedule and amenities. However, at the Sunday night milonga/dinner, the students were invited to perform at the now highly acclaimed performance. It was great fun! There was also a certificate presentation from the teachers to the students. Monday had the last set of group classes, as well as some extra time to schedule those precious private hours with the teachers. So when you reserve your hotel room, make sure to specify that you want a late check-out on Monday, September 4. A fabulous Tango Boutique was set up as well featuring clothing, shoes, CD’s, and videos. Kana from New York had a wonderful time. I’m already looking forward to return next year, she wrote. Valorie and Alberto’ are wonderful teachers. Their classes gave me me a great opportunity to thin about teaching. Jack from Albuquerque thought that Reno was fantastic. The whole trip back all we did was talk about how much fun next year will be, he said, whether it be in Nawlins or Reno. All instruction was great and the best I have been exposed to since starting to dance tango. The last official weekend of the Summer went out in great tango style. Dancers from seventeen states attended Planet Tango‘s Third Annual Tango Getaway at the fabulous Reno Hilton in Nevada September 3-6. This year the attendance doubled. Many dancers from the Bay Area, Reno and Las Vegas added local flavor to the event. The event was very well organized by Alberto Paz and Valorie Hart, and their classes along with th other fabulous instructors were something very special. 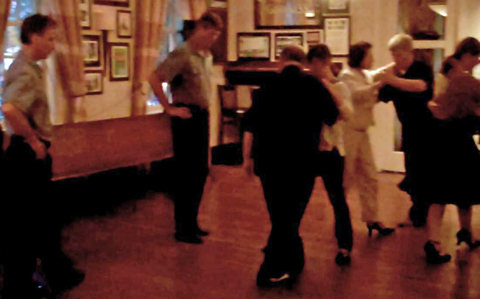 The traditional casual get together on Friday night to register, pick up schedules and stretch the legs on the dance floor turned out in to a full fledge milonga. Saturday morning, classes started in earnest with teachers Daniela Arcuri, Armando Orzuza, Guillermo Merlo, Fernanda Ghi, Valorie Hart and Alberto Paz. This year a Tango Barre class was added. In spite of the early 9 AM start, it was very popular and very well attended. Each couple had their own unique teaching style, grounded on authenticity and faithful to the roots of Argentine tango. All teachers spoke English fluently which added to the overall friendliness and quality of the classes. The Saturday night Reno Tango Ball was elegant and the attendance toppled 115 persons. Dining tables were appointed with taupe tablecloths and burgundy napkins. A centerpiece of two dozen roses placed on a mirror and surrounded by candlelight highlighted the tango elegance of the evening. Tuxedos and shimmering were in order. An Italian themed buffet was delicious and after the teacher’s exhibition, dancing went on until past 1 am. 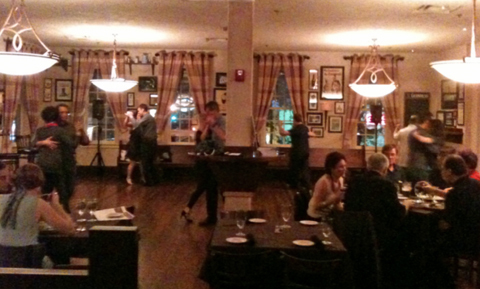 On Sunday night the ballroom was setup cantina style resembling the way some dance halls are set up in Buenos Aires. The theme for the buffet was a very tasty Mexican fiesta of the palate complete with the frozen Margaritas and Corona beer flowing form the bar. Colorful table linen, huge Mexican paper flowers and pierced tin silver candle holders added the finishing touches to a festive evening. Monday morning classes were held until noon and participants did one more brisk last minute shopping for CDs, shoes, art work, videos and clothing. The teacher, the logistics, and the unique class arrangements made this event one of its kind and so far the best offering. Generic tango weeks are enjoyable and instructive but they all share one common flaw. People get to decide the level they are at, pick the teachers they want to follow and the classes they want to attend. By choosing one they miss the other… and they never know what they missed or whether they have made the right choices. The knowledge acquired this way is haphazard and incomplete. At the Reno Tango Getaway we expected to have some fun spending time with friends and making new ones while picking up or polishing a few techniques in the process. We did all of that and more beyond our wildest expectations. As far as learning is concerned Valorie and Alberto made a point to now each dancer even if they met them for the first time. With uncanny sensitivity and educated instinct they suggested which room people should choose. Each set of teachers spent the same amount of time in each room. The student to teacher ratio was the lowest we’ve ever seen or heard of. There were 12-15 couples in a class. No restrictions were imposed reagrding who could attend, but somehow the hosts juggled the roster and treated everyone with the same quaity time and instruction. Tango is a gift and we will always be grateful to Valorie Hart and Alberto Paz for sharing it with us. For the second year in a row, the Reno Hilton welcomed the Argentine tango and its faithful practitioners. 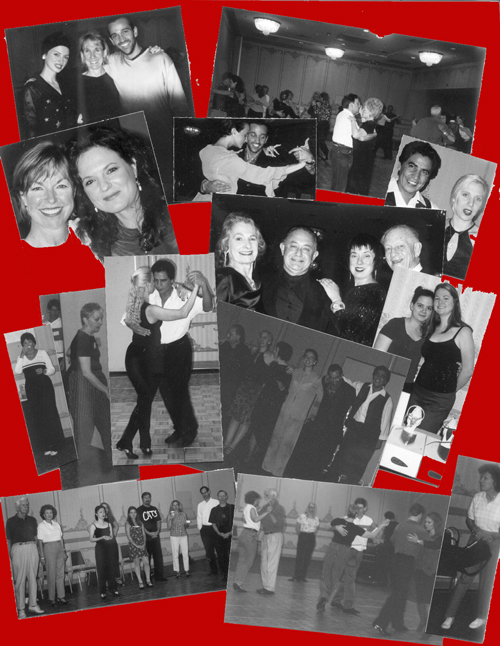 What began last year as a proposition to congregate a number of dedicated tango dancers under one roof with a selected team of experienced teachers for fun, work and play, has turned into a destination of choice for tango dancers around the nation.The Labor Day Weekend Tango Getaway is by far the best planned, organized and put together tango event in the United States bar none. But, then this is what you should expect when you decide to spend your time and money to enhance your understanding of the Argentine tango, its music, its dance and the vast amount of cultural information that comes attached to it. 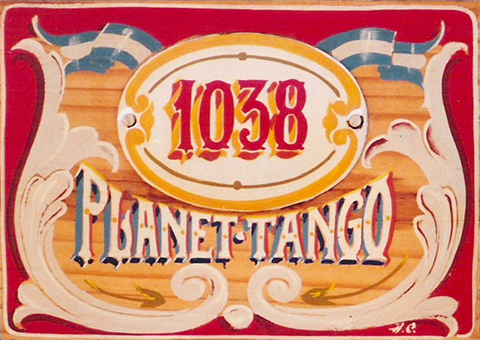 The Labor Day Weekend Tango Getaway is a yearly event sponsored by Planet Tango, and organized by Valorie Hart and Alberto Paz. People came from Nebraska, New York, Arizona, Florida, Michigan, Oregon, California, Utah and Nevada. The Michigan people in particular had to deal with the inconveniences created by the strike of Northwest Airlines, some of them flying stand-by and spending long hours at unexpected airports in order to make it to Reno. They had been there last year so they knew that the additional effort was worthwhile, and for that we are deeply grateful to them. Choosing the right mix of teachers is the key for an all around success in providing people with knowledge, entertainment and value. We invited Daniela and Armando back and brought from Buenos Aires an exceptional couple of teachers with an engaging personality, Leandro and Andrea. Both couples met and exceeded our expectations in terms of their ability to work with people and deliver fresh and creative material. It is a little hard to explain in writing, wrote Victor from Tampa, FL, you really had to be there. I had not met Andrea and Leandro prior to Reno, but would highly recommend their workshops to anyone who would like to improve their Tango. They both have a great grasp of the technique and are very good teachers. Their English is absolutely excellent and they both express themselves very well. Their style is very elegant and they focus a lot on improving posture, proper body positioning and accurate foot placements. I have read before about women who have felt cheated at various workshops by not getting any specific details for women. If you have a chance to work with either Daniela or Andrea, I assure that will not be the case. To have two instructors at the same weekend that pay equal attention to the women was very well received. This was also the first time that I had met Valorie and Alberto. I found them to be extremely competent organizers, excellent teachers, and delightfully warm and caring people. Their classes were focused on improvisation. This was accomplished by starting with a familiar movement and then changing it in a direction not so familiar. When the new direction started to become comfortable, then a different ending was added or perhaps a way to connect into another familiar movement that was not totally obvious. A great deal of emphasis was put on the importance of the man “marking” all of the movements, directions, and timing subtleties. The whole weekend’s workshops were very informative and filled with useful new ideas and applicable improvements. I would like to say “Thank You!” to Valorie and Alberto for supplying such a terrific opportunity to tango over the Labor Day weekend. Nancy and John from Santa Cruz, CA found the weekend relaxing, non-competitive, educational and fun. We learned so much in a few fun-filled days, they wrote, thanks to the clarity they all brought to every lesson. Leandro and Andrea brought their keen sense of musical interpretation to each detailed class and gave us inventive and beautiful embellishments. They focused on awareness of lifting the upper body while separating it from the lower, thereby freeing the legs. They are trained dancers and gave us a real taste of their training… slow and precise exercises which were never boring, each leading into useful walking combinations and figures, if we wanted to get fancy. Daniela and Armando were fun and snappy, as always. They are a pleasure to know. 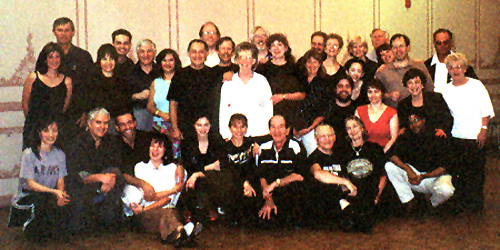 They taught great milonga rhythms, footwork, and expressiveness. They gave us their unique approach to the old-fashioned music, and performed gorgeous demonstrations generously to the delight of everyone, even during the lessons. Alberto and Valorie offered refreshing and challenging combinations and innovative moves, and most importantly, they showed how to lead them. This broadens our concept of what is possible in tango and keeps us from feeling complacent. We enjoyed meeting people from all over the US and dancing at the evening milongas with new friends. The teachers were very kind to mix in and dance with us, as well. We’re looking forward to next year!